Choose the best option to replace your missing teeth! Nothing can hurt a smile like a missing tooth. Why not choose the best option to replace your missing teeth? Fortunately, the team at TLC Dentistry are here to keep you smiling with confidence, thanks to dental implants. Dental implants in our Salinas dental office are the premier solution to replace missing teeth permanently. You can replace your missing tooth with a realistic and comfortable implant. There are many modern options available, and your dentist will be able to recommend the best one for you. The artificial tooth will provide you with the confidence you deserve while also making chewing easier than ever. The implant is secured into the jawbone so it functions just like a natural tooth. In the end, you’ll walk out of our office with a beautiful, confident smile. Why Choose Dental Implants in Salinas, CA? 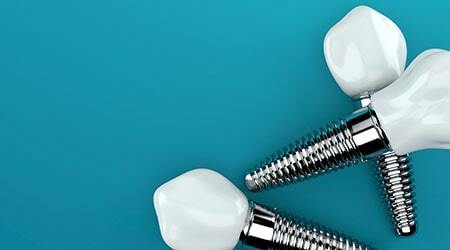 Implants mimic the tooth root, looking and feeling like your natural teeth. Dental implants look and feel like natural teeth. With our doctors’ expertise, they will enhance your smile’s appearance. You’ll feel more confident to smile proudly. Never worry about slipping and sliding dentures again! Implants are more secure than removable dentures and will stay in place and function like your natural teeth. For those missing just one or a few teeth, implants provide a reliable way to gain confidence and to minimize chewing or speech difficulties. Dental implants are a safe and effective procedure with a success rate up to 95% percent. As long as you do not smoke and continue to take care of your oral health, the implants should last a very long time. Your overall appearance will look amazing. With missing teeth, the jawbone begins to deteriorate, making your face appear saggy. Implants stabilize the jawbone because they mimic the tooth root, stopping the deterioration process. The implant process involves placing a titanium post into the jaw (from an outside expert) and then restoring a beautiful crown to match your smile. Our dentists don’t need to reduce your surrounding teeth, keeping your natural teeth healthy and functional. I always feel welcome. I am treated very well, and everyone is friendly and professional. I love you guys. Ready For Dental Implants in Salinas, CA? Since every situation is different, talk to your Salinas dentist today to see if implants are right for you. We use the latest 3D Cone Beam technology to help you determine if you’re a candidate. Our doctors will be happy to work with to ensure you love your new smile.